Watch the 2019 Gymnastics World Cup on BBC One and the BBC Red Button on Saturday, 23 March. Matt Baker presents live coverage from Birmingham's Resorts World Arena as the world's best gymnasts bid for individual and team glory. 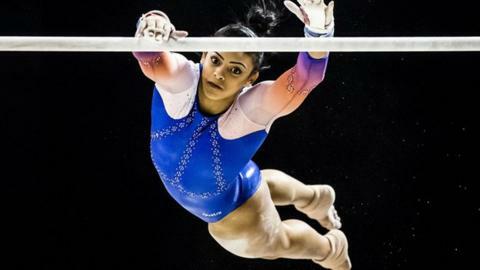 Former European all-around champion Ellie Downie will lead Great Britain's hopes in the women's event, but British champion Brinn Bevan has withdrawn from the men's competition through injury. Jamie Lewis, winner of five European medals at the 2018 Junior European Championships, takes his place. Triple Commonwealth Games champion Nile Wilson will miss the competition following surgery for an ongoing neck issue, and has been replaced by Birmingham's Joe Fraser. "It's going to be a completely new experience for me to compete in Birmingham and have the home crowd with me," he said. "My friends and family will be there to see me and finally get to understand what I work so hard for on a day to day basis." James Hall and Alice Kinsella both won bronze medals for Britain at last year's World Cup in the men's and women's all-around events.